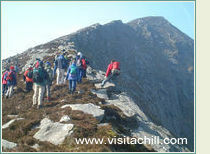 The annual Achill Walks Festival takes place in March, usually on the weekend preceeding St. Patrick's Day (March 17th). Established in 2002, Achill's Walks Festival has quickly become a fixture in the Irish walks calendar. Past events have seen up to 200 walkers taking part in guided and self-guide walks during the Achill Walks Festival. Evening entertainment, including informative slide shows, are often provided as part of the Festival. 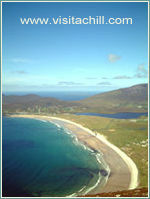 A distinctive feature of the Achill Walks Festival is the content of the guided walks. Rather than simply providing a leader to follow, the head guide for the Achill walks is a local outdoor pursuits professional. Well versed in local history and folklore, this guide also has qualifications in archaeology and is a professional coach in Mountain Skills. The guided walks are punctuated by informative and entertaining talks from the guide, highlighting the points of interest, local history, and geographical or archaeological detail. This makes the Achill Walks Festival truly a unique walking experience in one of the most spectacular walking locations in Ireland.